Fast-forward 121 years later, the concept of brunch in NYC has been elevated to not only a staple of New York City culture, but also a symbol of status. No wonder everyone wants to get in on the fun. It is meal of decadence, whimsy, scandal, and a whole mixture of things that don’t seem to go together, but taste just right. Whether you’re recovering from a night out with friends, introducing your new boyfriend to your parents, or celebrating your grandmother’s best friend’s daughter’s birthday, brunch is the perfect occasion to sleep in late, bask in the sunlight of a new day, and ignore any responsibilities, all in the name of breakfast food. With a push for innovation from social media foodie culture, New York restaurants are constantly evolving their brunch repertoire to incorporate much more than bacon and eggs. Because there’s always something for everyone on the menu, brunch is the perfect meal to share with your vegan coworker, your paleo pal, your gluten-free girlfriend, that one friend who wants to buy a bottle of champagne for the table because they can, that one friend who never has more than twenty-one dollars in their checking account, and just about anyone else you can think of! Westville has not one but six downtown locations, so if the Chelsea spot is full you can always take a stroll down to the one in West Village. But don’t mistake this for some run-of-the-mill restaurant chain, each Westville is cozy and personal with ingredients so fresh you feel like you’re at a New England farmer’s market. In fact, the menu features a ‘Westville Market’ where you can order any of their fresh, in-house produce as a side. From artichokes with parmesan to zucchini with mozzarella, they have the entire alphabet of vegetables at your fingertips. Is this starting to sound almost too healthy? Don’t worry, your vegetarian sister can munch on homemade granola or poached eggs over kale salad, while you enjoy a burger and baked challah bread french toast. This is the kind of unpretentious place where you can take just about anyone. Regardless of the amount of calories in your order, you can guarantee quality, local ingredients and a taste that rocks your weekend without rocking your budget. I’m not saying you have to order the Chicken & Waffles, but you have to order the Chicken & Waffles. That being said, Sweet Chick of central Williamsburg and the Lower East Side is an absolute must for a neighborhood atmosphere with five-star taste. For Southerners who are missing home and Northerners who want to find out what Southern comfort is all about, the menu is brimming with classic Southern dishes, from shrimp and grits to biscuits and gravy. For the crispiest fried chicken, the fluffiest buttermilk pancakes, and the creamiest mac and cheese, Sweet Chick is your new best friend that you’ll want to bring all your best friends to. 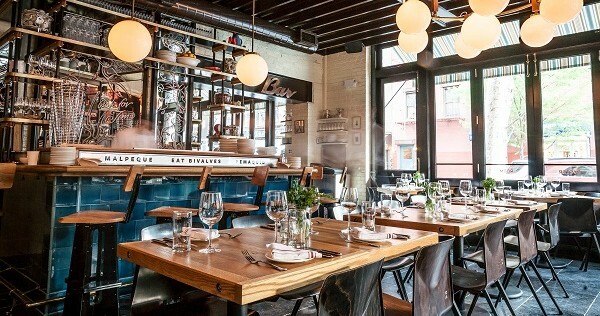 The restaurant is rustic and lively, featuring a bar with a variety of local beer on tap, a unique cocktail list, and a Bloody Mary with bacon that you have to order because, well, brunch. Bonus: NYC-bred rapper Nas is a major investor in Sweet Chick, and he loves the ricotta pancakes. Is your birthday coming up? Do you have to invite the entire 22-person group chat to brunch? Are you stressed trying to find a reservation for a place that won’t charge everyone a prix-fixe? Poco of Alphabet City is here to help! The menu features a combination American brunch classics and spicy Latin dishes. Poco is so accustomed to large party crowds that they have even devised a comforting dish for the-morning-after called “The Cure,” featuring crispy tortillas with salsa verde, queso blanco, topped with two scrambled eggs. If you want to order that alongside unlimited mimosas, Bloody Marys, and sangria, you only need about thirty dollars - and the servers at Poco are very generous with their beverage portions. With friendly wait staff and fun 90s music blasting in the background, your Friday night party can continue on into Saturday morning with ease. The inside of The Dutch is just as alluring as the sunny streets of SoHo that surround it. With big, bright windows, an elegant, fully stocked bar, and an attentive wait staff, this upscale American dining hub will bring an element of luxury to your morning meal. This spot is just romantic enough for a date, just classy enough to bring your family to, and just casual enough that you can still let loose and relax after a hectic Saturday night. The food is on the pricier side, but the quality is worth it. Savory food dominates the menu, featuring fresh oysters that are to-die-for and perfectly poached eggs with Canadian ham and chipotle hollandaise in your own mini crockpot. To please your sweet tooth, you can enjoy freshly baked donuts, with flavors like matcha and sticky bun, off of a tree! There’s also a great selection of caffeine, two insane Bloody Mary variations, and two fresh-pressed juice blends -- if you’re looking to cleanse your body and soul. The Dutch, while remaining simplistic, has a keen attention to detail in its decor, its service, and of course, its unparalleled food. Follow Emma Nanamaker at @fordhamfoodie.